Hello everyone this is Sr.Nitrado, I'm actually the Country Manager for Latinamerica and Spain, but I will be helping out a bit here in the English Forums as well. I have coordinated with Wilcox, the UK Country Manager to add a link to this guide, just before you guys can write a Support Ticket. Many times, you don't really know how to describe the problem, or don't know what information we will require from you. This guide will help you a bit. First thing to do is ask yourself a few questions. Stay up to date with Reddit, Forums, Gamedevs Social Media (Facebook/Twitter). If it's a Client-side bug, we cannot do much. Server configuration, name it Plugins, Mods, Automix, eBot, ProCon, Rusty, Oxide2: it all depends on you. We might ease your trouble with guides on how to install some mods, or adding them as One-Click-Installation if they become popular/requested. But anything else besides what you get when you order the server, you are responsible for it. We sadly cannot take responsibility for a mod not created by the game devs or ourselves and is not working properly. Please try to troubleshoot your server to know your modification are not causing any problems. If somebody already had your problem, he/she might have already solved it by help from the forum community. It's worth a shot trying to find out the answer for your problem there before writing us a ticket. We are developing this FAQ and more and more small articles are created everyday. It is a work in progress, but it might include what you are looking for. These FAQ are shown in the webpage before the one where you can write your support ticket. The Nitradopedia is full with guides about server management. Some of the best guides posted in the forum will have their place in the Nitradopedia, and also we might reward good samaritans with Nitrado swag. Now, please don't be scared about writing us a Ticket! It's just that we get a lot of tickets everyday, and your might get delayed because of our FIFO (First in First Out) system. This will save you time, in case the problem you are dealing with is something you could solve faster on your own. Nevertheless, we are always here for you! Let's say you answered '''NO''' to each of these questions: now it's time for you to write us a kickass Support Ticket. The subject is the first thing we see in our never-ending list of tickets. This is very important, so we can already prepare ourselves for solving it. It would be '''very important''' for you to add the following '''information''' to the ticket's subject. First, we would like to know the game which is causing you problems. For example in case you are having problem with '''ARK Survival Evolved''', add [ARK] to the subject. Other example could be [CSGO], [BF4], [BF3]. [BFH], [MC], [Rust], [Arma3]. Second, adding the location of your server would be optimal. We have a lot of locations worldwide, for example: Buenos Aires [AR], Frankfurt [GER], New Jersey [NJ], Los Angeles [LA], London [GB], Istambul [TR]. Subject: $%&/()$%&/($%&/) (yes, we had that one)"
This would be all for the subject, now we will optimize the way we answer to your tickets. Let's talk about the content. Many problems have a detailed way to be solved, and for us to give you this solution we will need some concrete information about the problem/error/crash. When you send a support ticket referred to the following topics, please include the following required information. - The result of a [https://wiki.nitrado.net/en/Tracert TraceRT] done to the server IP (Don't include the Port). Please add the .txt as an attachment to the message. - Exact time of the day when this problem happened: Please include the time as Central European Time (CET) or if not state which time zone you are in (in GMT). Please be as precise as possible. We will need the exact moments this happened so we can check for anomalies in the services at the said times. Also please any relevant information like the Gamemap being played, the amount of players logged in. Anything you consider relevant. A lot of people might think '''Well it happens all the time'''. Well then, it will be really easy for you to name an exact time. Tell us about any Mod/Plugin you had installed prior to this happening, or any changed in the config you might have done before this error occured. In this case please send us a '''screenshot''' and an error number or description you got. You can use Gyazo or a similar software for doing this faster. Tell us in this case any error you might get (with screenshot), also which software you used to connect, although Filezilla works 99.9% of the time. If your server crashed to no error message, let us know the exact time. This way we can find out what happened. Our policy is, if the error was caused by us, you will get the downtime refunded. This being said, if the ticket your wrote us has the information we need. An incomplete ticket will just result in us asking you for more information and your ticket being put in the last place of the queue. If you happen to have 3 different servers having three different problems, write three individual tickets. Thanks a lot for reading this and I look forward to your awesomely written Support Tickets! In the second step, it will show a button "No solution found" which will bring you closer to the actual ticket. It will show the info to call nitrado aswell as the link to the support ticket. After selecting the ticket / email option, you have to select the service you are having problems with and it will show a form to enter all the details. How could we sent a email , Or a support ticket ? Or a payment ! we have no Access to them! Nothing is working properly on your Sites or forum Nitrado. Sigh.. This page kept going back to another page. Took me forever to get it open. Fix your links . Update this place please.. Seriously ..
That is the Support link to create a ticket and also provides contact information for support. 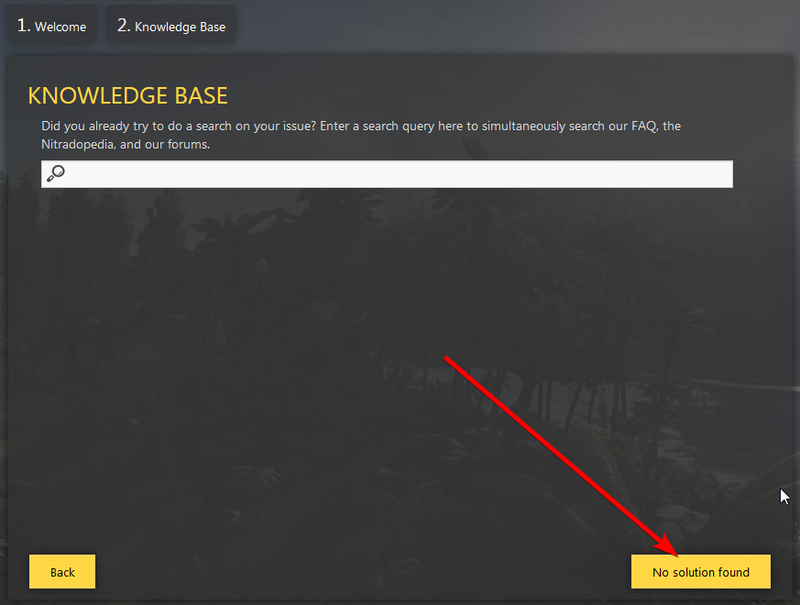 That Knowledge Base isnt much help and yes I have researched and searched and I have always done so. ISN'T THERE A LINK TO A ACTUAL SUPPORT TICKET AREA? -SIGH I DON'T SEE IT ??? You just have to click trough the assistant, many problems can be fixed with help of the knowledge base. If there is no solution for you, you can always click on the "no solution" button.